Less than 2 months till Alaska! The posts covering last summers travels in the trailer are almost caught up. I should have known better and done them during the actual trips but being a RV newbie I had a lot of other things to worry about. Anyway back to the Alaska Trip! At the end of May we are packing up and heading off a big adventure to Alaska. It is along way (over 4600 miles 1 way). We think it is going to take about 4 months total, with a month to get there 2 in Alaska and a month to get back. We are setting off from Boston and my Brother and his wife and their Airstream will be heading off from Texas. We will rendezvous someplace and travel together for a the middle of the trip. Right now we have tentatively planned to meetup in Edmonton. 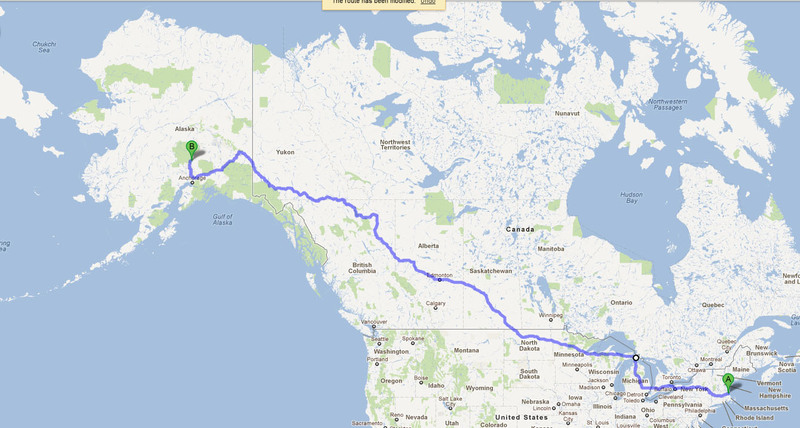 Below is a rough Google map of the route to Denali NP. We have a reservation at a campground 28 miles into Denali NP, otherwise the trip is pretty much unplanned or will be planned on the way. Checkout the route map an if you know of something we simple have to see or someplace we have to eat drop us a line. Or if you are on the route let us know and we will stop in for visit!